The 20-year-old clocked 26.76 seconds to put herself on the podium. RAHENY SHAMROCKS SPRINTER Orla Comerford added to Ireland’s medal haul at this week’s Para Athletic European Championships with a brilliant bronze in the T13 200m. The Dubliner came home third in 26.76 seconds, losing out to a new Championship record set by Ukraine’s Leilia Adzhametova while Carolina Duarte claimed silver for Portugal. The bronze medal comes after yesterday’s triple gold return and also Noelle Lenihan’s success in the F38 discus this morning. Also out in the sprint events this evening was Paul Keoghan, who clocked a season’s best 25.20 to come fifth in the T37 200m final. Patrick Monahan also placed fifth in the final of the T53 400m. 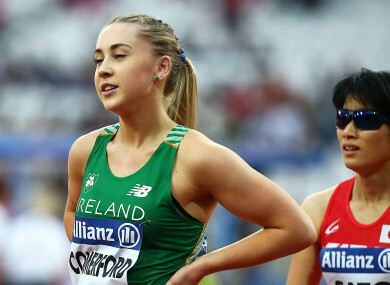 Email “Comerford claims brilliant 200m bronze for Ireland in Berlin”. Feedback on “Comerford claims brilliant 200m bronze for Ireland in Berlin”.